A soothing moisturizer is a must for everybody with overly sensitive skin (including rosacea and eczema) – and an elective for everybody else. It is characterized by calming down your skin rather than over-stimulating it, and can be used all over your face or just on especially irritated or sensitive areas. Even people who otherwise have “normal”, more robust skin can benefit from using a calming moisturizer occasionally if they have irritated their skin too much by using harsh cosmetics, whether in the shape of makeup or skin care products (containing ingredients such as AHA, BHA or retinol). Needless to say, soothing moisturizers should not contain any fragrance as this kind of ingredients might aggravate your skin even more. Below we have made a list of the best calming moisturizers for various skin types and as several of them come in more or less rich versions, it should be possible to find something which is exactly right for you. Be aware that none of these calming moisturizers contain sun filters and thus they can only cover the Moisturize (M) step of a COMP skin care routine. The lightweight texture of AM Therapy Moisturizer from EltaMD will go smoothly on your skin and soothe it with its various skin-repairing ingredients such as niacinamide (vitamin B3), vitamin C, hyaluronic acid and Piptadenia colubrina peel extract. The latter has through research been shown to stimulate the so-called aquaporin activity so that hydration is increased and maintained, which is great for normal to slightly dry skin that needs moisture without being overloaded with oily formulas. In spite of its name, EltaMD’s AM Therapy Moisturizer does not contain any sun filters, so it should be used under sunscreen in the daytime. La Roche-Posay’s Toleriane line for sensitive intolerant skin includes a bunch of great products and the Toleriane Daily Soothing Moisturizer is no exception. This cream-lotion is hydrating without feeling oily or greasy, and is thus appropriate for all but the most dry or oily skin types which need more or less emollients in their skin care routine. However, the Toleriane Moisturizer also comes as a richer cream (great for cold winters or very dry skin), a fluid (for oily skin) and a specially packed lotion which is free of any preservatives, so anyone who feel like their skin might need some soothing hydration can find the perfect product. 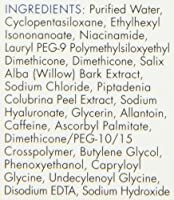 Ingredients – La Roche-Posay Toleriane Daily Soothing Moisturizer: Water • Cyclopentasiloxane • Isocetyl Stearate • Squalane • Glycerin • Isononyl Isononanoate • Pentylene Glycol • Aluminum Starch Octenylsuccinate • Cetyl Alcohol • Peg-100 Stearate • Glyceryl Stearate • Dimethiconol • Ethylhexylglycerin • Acrylates/C10-30 Alkyl Acrylate Crosspolymer • Sodium Hydroxide. Sensitive skin is not necessarily dry, but can just as well be oily or combined – which is something that many skin care manufacturers overlook. 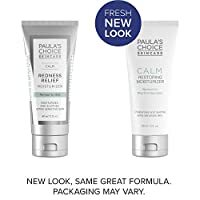 The Calm Redness Relief Moisturizer from Paula’s Choice caters to those who have extra sensitive oily skin or even suffers from rosacea as it provides light hydration along with a number of anti-irritating ingredients as well as antioxidants. It can also be used by those who have acne or breakout-prone skin which is dried out or irritated by anti-acne treatments prescribed by a doctor or dermatologist. Stubborn acne does sometimes need these treatments to be cured, but a moisturizer like the Calm Redness Relief will help your skin to look and feel better in the meantime. Ingredients – Paula’s Choice Calm Redness Relief Moisturizer: Water (Aqua) • Cyclopentasiloxane (silicone/skin-conditioning agent) • Glycerin (skin-repairing ingredient) • Butylene Glycol (water-binding agent) • Bis-Phenylpropyl Dimethicone (silicone-based skin-conditioning agent) • Glycyrrhiza Glabra (Licorice) Root Extract • Allantoin (anti-irritants) • Beta-Glucan (anti-inflammatory antioxidant) • Dipotassium Glycyrrhizate (licorice-derived anti-irritant) • Epilobium Angustifolium (Willow Herb) Flower/Leaf/Stem Extract (anti-irritant) • Phenyl Trimethicone • Dimethicone (silicone-based skin-conditioning agents) • Dimethicone/Vinyl Dimethicone Crosspolymer (silicone-based texture enhancer) • Sodium Hyaluronate (skin-repairing ingredient) • Arctium Majus (Burdock) Root Extract (plant anti-irritant) • Camellia Sinensis (Green Tea) Leaf Extract (anti-inflammatory antioxidant) • Laminaria Saccharina (Algae) Extract (water-binding/soothing agent) • Vitis Vinifera (Grape) Seed Extract (antioxidant) • Panthenol (skin-repairing ingredient) • Sodium Acrylate/Sodium Acryloyldimethyl Taurate Copolymer (film-forming/thickening agent) • Hydroxyethylcellulose (thickener) • Isohexadecane (dry finish solvent) • Sodium Carbomer (gel-based thickener) • Polysorbate 80 (emulsifier) • Ethylhexylglycerin (skin-conditioning agent) • Phenoxyethanol (preservative). The BioDerma Sensibio AR moisturizer is great for those with sensitive and dry skin as it is mainly based on a mineral oil (paraffinium liquidium) rather than plant oils which can be harder to tolerate for sensitive skin. There is, however, also a fair amount of canola oil in it. Just as important, the cream is rich in antioxidants and skin-repairing ingredients like allantoin, rhamnose and extracts from ginkho biloba, liquorice and green tea. 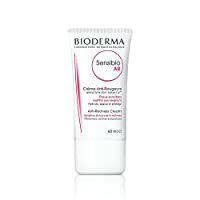 Note that, unlike Bioderma’s claims, the Sensibio AR cream (as well as the other moisturizers on this list) cannot treat rosacea or repair broken capillaries but it can still be very helpful in calming your skin and reducing redness in other ways. Although CeraVe PM Moisturizing Facial Lotion is the cheapest moisturizer in this review, it still has a lot to offer to people with normal to dry skin. Besides the cell-communicating ingredient niacinamide, the lotion contains skin-identical ceramides which can help restore the skin’s protective barrier as well as hyaluronic acid which reduces inflammation and helps the skin to hold on to moisture – exactly what dry skin needs assistance with! CeraVe PM Moisturizing Facial Lotion comes in a practical bottle with a pump that helps to keep the beneficial ingredients stable. It does contain parabens (methyl- and propylparaben), but none that should be a cause for concern. Posted in Skincare Reviews and tagged anti-redness, Bioderma, calming moisturizer, CeraVe, COMP, EltaMD, La Roche-Posay, Paula's Choice, skin care routine, soothing cream.